NASA scientists are meeting to discuss how best to identify signs of other technologically advanced civilizations in the universe. We love our technology, so maybe it's natural to hope that somewhere else in the universe, another form of life also clings to similarly shiny tools, and perhaps in ways we could spot at a distance. Scientists have been looking for the signatures of such civilizations for decades, so far in vain. But this week, NASA is hosting a conference dedicated to rethinking the quest: NASA wants scientists to evaluate how far the search for technosignatures has come and what the most promising possibilities for the future are. You can watch that conversation take place live today (Sept. 26) through Friday (Sept. 28) on Space.com, courtesy of NASA TV. Presentations will include discussions of different types of technosignatures, how different types of technology can pick them up and what other developments like the rise of big data offer to the field. 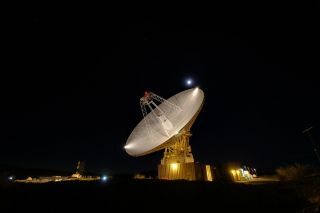 The workshop includes many speakers who have been leading the search for extraterrestrial intelligence for decades. And if just listening isn't enough, several panelists from the conference will be participating in a Reddit Ask Me Anything tomorrow (Sept. 27) at 1 p.m. EDT (1700 GMT).